Fashion watever: Delayed post from yesterday .. but they are still fresh ! Delayed post from yesterday .. but they are still fresh ! Wat : This is a much in-demand Body con skirt .. Last I heard, they are almost sold out .. So if you are looking for a skirt for work and play .. Quick ! Go visit them ! Wat : Rawwrrr ! 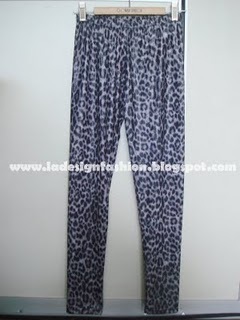 This Leopard print leggings will surely suit bold people who loves wild designs. Wear this with a simple top, it will surely make people heads turn ! Wat : This blog is a shop that sells all types of cool japanese stuff. Be it Kimonos , yukatas, japanese clogs and also other japanese products. In their newest post, they have this new golden colour obi. Wat : Flash ! Flash ! 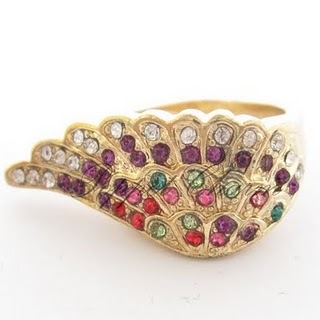 This rhinestone wing ring surely catches eyes. With its glittering stones and golden colour hue. Adorn your fingers with this ! wat : Babydoll + Tribal prints = Tribalprint babydoll dress. Isn't this a cute dress ?